Inside Out, Disney Pixar’s latest film, follows the pre-pubescent years of young Riley (Kaitlyn Dias), a hockey-loving, family-orientated young girl whose life seems absolutely perfect – until her parents make her move with them from Minnesota to San Francisco. This sudden change prompts a swirl of uncontrollable emotions; those complex ones that are difficult to understand and deal with, especially for a young adult. The main protagonists of the film are the emotions living inside Riley’s head: Joy (Amy Poehler), Sadness (Phyllis Smith), Disgust (Mindy Kaling), Fear (Bill Hader), and Anger (Lewis Black). Throughout the intense changes in Riley’s life, her emotions struggle to deal with the huge ups and downs. Most of the action takes place inside Riley’s head where the emotions live. The depiction of this inner neural area is not just Pixar-animated cuteness; it’s incredibly clever. Riley’s emotions spend their time in ‘headquarters’ where they ‘control’ how Riley feels. When Joy and Sadness end up getting shot out into her neural network, a scary and unknown maze of unpredictable proportions, they must find their way back to headquarters. What they learn along the way is that Riley doesn’t need just Joy or just Sadness to survive, she needs both of them, in fact all of her emotions, to learn, deal with, and experience her every day life. There is so much about Pixar’s latest film Inside Out that is absolutely perfect. It makes you laugh out loud, makes your face wet with big sloppy tears, makes you really think about mental health, pop culture, growing up, parenthood, and stress, and to top it all off the animation is spotless, imaginative, and fun. I would call Inside Out our modern day version of The Lion King, but in saying that I’d have to admit one thing. I think it’s better than The Lion King. Inside Out tackles just about everything that kids – and adults – need to know about living in our modern world, from how to deal with puberty, changing emotions, parenting, working, dreaming, fitting in, not fitting in, eating, loving … just about everything! It succeeds in being truthful and compassionate whilst staying amazingly silly. It’s beautiful be told in a kid’s film that feeling sad is actually okay, and that sometimes when you are happy you can also feel angry or that fear can often lead to joy, and these feelings are okay too. Inside Out teaches us to accept everything we feel, teaches us that it’s normal to be complicated, to hurt, to love, to laugh, and that this is what makes us, us. The writers, director, and creators of Insidie Out certainly didn’t seem to have had anyone breathing down their necks while they were making it; the film feels genuine. 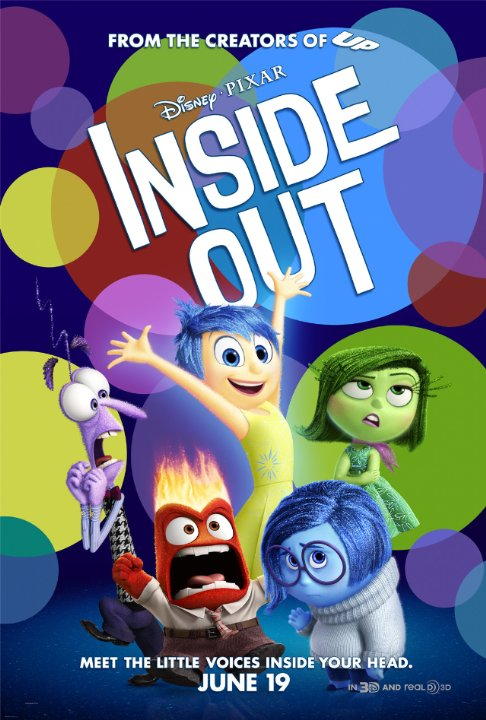 It’s a huge breath of fresh air to see a studio produce something so freaking beautiful and at the same time something that points its finger and laughs at mental health stigma and the denial of women’s rights; themes that exist in multiple Disney films but that are explored in a new way in Inside Out. Although not an explicitly feminist film, Inside Out produces a female protagonist who isn’t unattainably gorgeous; she’s in fact a bit nerdy, and a bit shy. She also feels depressed, and this isn’t mocked, but is in fact celebrated. Being a young, and sometimes confused, girl is not looked down upon; her inner workings take centre stage and are treated sympathetically. The spotlight shines on a girl we can all relate to, instead of some super skinny, strangely-proportioned princess. Inside Out takes a huge stand against mental health stigma, a bold political move by Pixar but damn, I am delighted it’s finally happened. This is a film I will show my kids. This is a film every child should watch as part of their school curriculum. This is a film that will truly make a difference in our hectic, crazy world. If you don’t believe me, do a simple Google search, and you’ll see an array of articles, opinion pieces, and reviews already online about how much this flick has effected people across the globe. All we can only hope from here is that the message really sinks in; that we all take the lessons shown and apply it to our everyday life. I took my munchkins to see this movie today and was blown away by its depth whilst still providing plenty of knee-slapping moments.